Tighter control measures to reduce the risk of bovine TB spreading between cattle are to be introduced as part of the drive to eradicate the disease in England. The strengthened rules, which will come into force from 1 January 2013, include changes to the surveillance testing regime and cattle movement controls. “We need to stop the spread of bovine TB, which led to the slaughter of 26,000 cattle last year alone. England will be divided into two cattle TB testing frequency areas. Annual TB testing of farms will be extended in the south-west, west and central England, and East Sussex to include adjoining areas which are at greatest risk from geographic spread of TB as well as the existing high risk areas where most TB cases are found. The rest of England will be placed on four-yearly testing. Most TB breakdowns in this area are caused by the movement of infected cattle from the high risk areas. However, surveillance around TB breakdowns in the four-yearly tested area will be enhanced and herds at higher risk of TB infection will continue to be tested annually. TB free cattle are sent to Approved Finishing Units (AFUs) from TB infected farms for fattening before they are slaughtered. The conditions in these will be strictly monitored to maintain high standards and prevent the spread of TB. Some operators could even see their licences removed for serious breaches. “The Government and the farming industry are committed to doing all they can to halt the spread of TB. TB testing intervals will now be set at the county and not the parish basis. This is in line with EU law. Using a larger administrative unit than the parish is better epidemiologically and reflects a clearer picture of the distribution of the disease in England. In addition to the counties currently on annual testing, Cheshire, Derbyshire, Nottinghamshire, Leicestershire, Northamptonshire, Oxfordshire, Buckinghamshire, Berkshire, Hampshire and East Sussex will all be placed entirely onto annual testing. The new annual testing will area includes the existing high risk area where most TB cases are found as well as adjoining areas which are at greatest risk of geographical spread of disease in the short to medium term. Mandatory interferon-gamma blood testing of new OTF-W herds will continue, including for the time being in areas which in 2013 will be on annual testing but which in 2012 were either on 2, 3, or 4 yearly testing. Discouraging late testing of cattle for bovine TB to reduce disease spread risks for all cattle by reducing compensation for owners of TB affected herds if tests are overdue by more than 60 days. 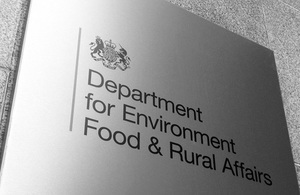 Defra is developing measures to further reduce disease risks, including targeting the edge of the infected [or high risk] area, risk-based trading, reviewing use of interferon-gamma blood testing and how we deal with persistent herd breakdowns, and looking at measures to deal with TB in other species. Details on these will be announced as they are developed.